Disney/ABC Television provides the world with a diverse composition of entertainment. One of its properties is ABC Family., which is one of the cable’s top 10 networks. The network’s programming includes original series and movies. Pretty Little Liars (the No. 1 scripted show for females between the age of 12-34 in the year 2012) and Melissa & Joey (cable’s No. 1 program at 8 P.M. on Wednesdays) are both original ABC Family programs that contribute to its great success. ABC Family has a long list of original movies including Labor Pains, which features American actress and recording singer Lindsay Lohan. These are only two of many properties that are owned by fall under Disney/ABC Television Group. All programming from Disney/ABC Television Group properties reach a different fragment of the general audience. The company is able to attract the views from crowds that are female or male, young or old etc. Founded in 2004 Disney/ABC Television Group is a large division of The Walt Disney Company that is in charge of, “global entertainment and news television properties, owned television stations group and a radio business .” The Group is currently run by Disney Media Networks President Anne Sweeney  but by the end of this year she will be succeeded by Ben Sherwood . The Group is divided into 6 different businesses that run ABC and Disney Television, production and distribution, and radio development. These include: ABC Entertainment Group (which is a joint business of ABC Entertainment and ABC Studios), ABC Family, ABC News, ABC Owned Television Stations Group, Disney/ABC Television Group Digital Media, and Disney/ABC Domestic Television . In the Nielsen November Sweeps period ABC had the most impressive numbers across the board for non-sports programming for adults 18-49. ABC’s press release on November 25, 2014  showed that ABC beat out CBS by 31%, NBC by 31% and Fox by 61% in terms of overall viewers. Up 1% in Viewership (Adults 18-49) from last November – which is equal to 100,000 more sets of eyeballs. Number one for 4 of 7 nights in any week in November – this also includes the top spot for every Thursday thanks to their 8:00-10:00 lineup. From executive producer Shonda Rhimes this drama follows law Professor Annalise Keating (Viola Davis) as she involves herself with four of her students . Latest Thursday rating was 3.1 and viewers were 9.82 million in adults 18-49 . Part of the, “Shondaland” Thursday lineup in the 1 hour 10:00pm spot . In ratings and total viewers the show was up 7% in it’s last week . The show is currently on a holiday break until 1/29/15 . Thursday has been a HUGE night for ABC this fall. “Grey’s Anatomy” is 8-9, “Scandal” is 9-10 and then the newcomer “HTGAWM” follows that at 10. 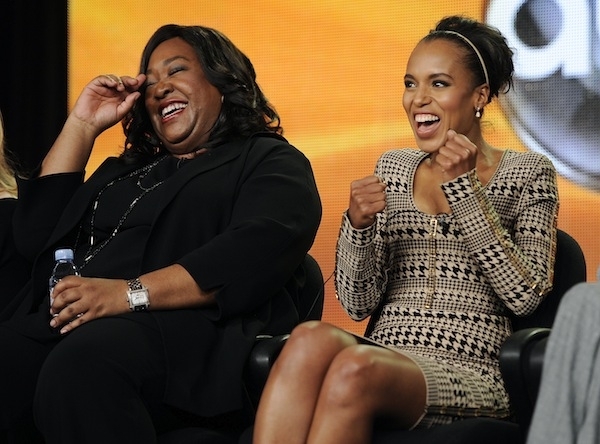 Each show shares executive producer Shonda Rhimes. For all of November sweeps ABC won Thursday Nights for the 4 consecutive weeks of the period. Dr. Henry Morgan (Ioan Gruffud) is the top medical examiner in NYC, the secret behind his success? He examines the dead to try to find an answer to his own immortality . 1.0 rating in adults 18-49 which is up from the previous weeks 0.9 . Tuesday 10:00 1-hour time slot. 2.6 rating and 7.82 million viewers in adults 18-49 . Wednesday 9:30 half-hour time slot. Cristela (Cristela Alonzo) is in her sixth and final year of law school but her traditional Mexican-American family is having trouble understanding her pursuit of this career. Cristela tries to balance old traditions with the modern world that she is working and living in . 1.0 rating and 5.19 million viewers in adults 18-49 . Fridays at 8:30, half-hour time slot. The full season has been ordered for the show, meaning 9 new episodes are on its way for the freshman comedy . Eliza Dooley (Karen Gillan) has tons of social media ‘friends’ but seems to be missing some actual friends. She asks the help of a marketing guru played by John Cho in order to ‘rebrand’ herself to make real-life connections . The show order was for 13 shows, but it was canceled after 6 airings . It’s been rumored by the shows executive producer, Emily Kapnek, that the entire series, including the 7 un-aired shows, will be released on Hulu . Its last rating was 1.5, 4.7 million viewers in adults 18-49 . This comedy exposes the differences in thought between men and women as they begin dating. This leads to opposing thoughts, and differing actions between new couple Dana (Analeigh Tipton) and Peter (Jake McDorman) . After 4 episodes aired the show was pulled . “Selfie” and “Love Story” were back-to-back half hour-comedies that filled up the 9:00 hour on Tuesdays. It was a tough lead-in for ABC’s drama “Forever” at 10:00 . However, “Forever” hung-on for a full season where as the comedies got the axe. ABC has 3 new dramas, “American Crime,” “Marvel’s Agent Carter,” “Secrets and Lies,” and a comedy, “Galavant,” slated to premiere in early 2015. There’s also the drama “The Whispers” and the comedy “Fresh Off the Boat” which have yet to be slated . Under the ABC Owned Station Groups, Disney/ABC is launching a new syndicated talk show with host Tyra Banks. The title as of now is, “The F-A-B,” which stands for Fun and Beautiful. It will include a panel of lifestyle gurus who will answer questions and talk to celebrities about what’s going on in social media, food, fashion and more . ABC and producer Mark Gordon are writing a comedy with, and starring Iliza Schlesinger, called “Forever 31.” The hope is to make Schlesinger the top female in primetime comedy. The show depicts the struggles of her and her friends trying to become adults and the comedic trials of their everyday lives .